In The BBX Investigation thus far I have shown immorality and incompetence within the BBX International management. I have stated broadly that membership numbers as claimed are inflated. I now give evidence [proof] of the extent of this deception, which is in the order of a factor of 10. Some entire countries within the BBX operations are essentially simply names in a database with no trading at all a modus operandii along the lines of the Ormita fraud and the Qoin con. This is the post that doubters and fence-sitters would be well advised to digest thoroughly. For those new to the industry or for those considering entering the BBX network, it is critical information. Before I go into the actual BBX membership numbers, I wish to make this clear that all the data I have used is accurate, has been obtained 100% legally and can be verified to anyone who seeks this verification. I repeat this statement but use a negative turn of phrase because it is important . . . no hacking is required to obtain this data legally. I’ve already explained that BBX International has grossly insecure systems. That I can [incredibly] analyse data from the BBX International management systems in as close as it can get to realtime as is possible should concern any reasonable business person. Except for the fact that BBX management knows of this data insecurity, one would normally have expected a diaper change for BBX management (and their cronies in crime) around about now. Not so, for those who have cognitive dissonance it appears. First up, the BBX International database contains all critical personal and financial information in an insecure privately operated online ‘relational’ database offshore from Australia without members’ knowledge or approval (totally illegal in Australia and the EU). Let’s go through this in a little more detail. China is a con job, through and through. I will be sharing more details around the BBX China debacle at a later date. One can effectively ignore the Chinese operations lock stock & barrel when assessing the reality of BBX International. BBX International is ‘dead’ without the UK. If or when BBX UK pulls out or goes under, BBX International will exist in name only. The numbers in BBX UK only tell one part of the story. The type of members tells another part. The products and services available speak a volume (it’s not pretty). The marketing and business approach of the principals and the actual trading volume is yet another. All factors point to a young exchange charging ahead to sign up (largely) lower quality members to play the numbers game. In future posts I will be explaining how presenting huge numbers (numbers of countries and numbers of members) is an essential part of the franchising presentations. The bottom line is that BBX UK’s membership is not of the quality presented to the world. Australian membership is predominantly Sydney-based most franchisees having given up and gone elsewhere, shells of exchanges attempting to keep some form of presence. BBX Head Office has retrenched into a small shop-front and trading is suffering as confidence in the BBX brand and currency plummets. There are pockets of activity from the die-hards and those with an agenda. It is essentially operating at a tenth of what it was a decade ago in its hey-day and trading has dried up. I will analyse the Australian membership figures and financials in greater detail shortly. In a recent post I gave confirmation that BBX India is totally dead, again. Bills including rent were not paid. Staff sold computers to get their wages. There is no BBX India. Again I have previously shared the reality here in New Zealand, my country of birth. No trade. No confidence in either the brand, the company or the currency. It is a standing joke among the real traders here and has been for years. No one willing to sell anything of value. No sign of the Franchisee. Skeleton part-time staff with high staff turnover all attempted to be run from Australia unsuccessfully. Situation normal for NZ members going back years. All totally dead, some for years. So this, by the actual figures shows the reality of BBX International with 88,000 cardholders in 13 countries. My best estimate is that true membership numbers, going by the IRTA definition of a member (which is that they must have traded at least once in the preceding 12 months) is that BBX International has less than 3,000 genuine members internationally (it may indeed be less than that) and that it is actually operating in only two countries (Australia & the UK) with very little actual trade between the two, if at all. In this analysis I have more than halved the UK numbers to remove non-members by IRTA’s definition and ignored China totally. I will detail my reasons why I have done this in future posts, as I said earlier. While BBX International is presented as a Hong Kong conglomerate, in reality it is and always has been run in New South Wales in Australia by the Touma family. Michael and his wife Mireile established it and built it in Australia. Both the daughters actively involved with it are based in Australia. 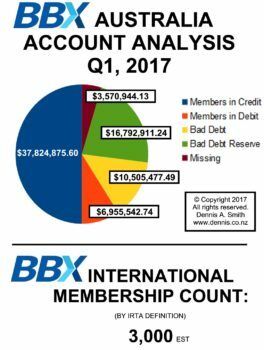 The bulk of the membership was Australian and nothing really eventuated from offshore Franchises, the recent splurge by BBX UK being an exception. Michael’s style was more akin to a salesman on steroids, taking opportunities as they came and capitalising on the huge opportunities that running a commercial barter operation affords. He would take and leverage the currency to the maximum at every turn, playing with “funny money” often very effectively, especially with property, but equally as often doing ‘dumb deals’. He was highly skilled at what he did but lacked the stability and ethics that building a genuine long-term business required. You can see the resulting carnage when analysing the string of failed franchises, endless conflicts and politics both within his family and within the business. Deception by way of over-talk and under delivery was the norm and long-term relationships few and far between. He burned off many over the years and his offspring have continued the same style, but without the same charisma and experience this has caused destruction of the BBX ship from within. I digress here for a moment, to note that for those who resent me openly bringing a speedy end to BBX, a festering abscess in the commercial barter industry, I am simply shining the light on reality. Others have committed the acts of greed and deception that I comment on. Please be careful not to shoot the messenger. There are multiple sources of income within a traditional barter exchange. As I have detailed with Bartercard’s problems, BBX membership figures show poor metrics in all regards – falling cash income from fees; reducing sales/sign-ups; downturns in trading volume as the exchange goes into grid-lock. Except for the BBX UK aberration BBX International has essentially petered out and BBX Australia is not far behind. The bulk of BBX Australia now operates with poor quality Franchisees, and over the last few years Head Office has ‘acquired’ members by default as a string of Franchisees have come and gone, often in conflict situations or having substantial losses. When diving into an exchange’s figures I look for two things first: a) the debit/credit balance and b) the members’ Bad Debt Reserve. In a healthy exchange you should find that members in Debit roughly equal members in Credit. It’s not critical to have it balanced 50/50 because the currency operator can legitimately (according to IRTA’s guidelines) slip a little bit sideways for the health of the exchange, but large numbers of members with Credit balances and large numbers in the category of bad debts makes for a sorry state of affairs – wealth has been pilfered somewhere along the lines, usually by the exchange owner(s). Likewise with a healthy exchange there should be some Debt Reserve Fund. If an exchange is young it is likely to be with a positive balance, ready to accept a hit if one of the members falls over. Typically an exchange that is bending the rules a little may watch this disappear over the years and member losses exceed member contributions to the Fund. One can conceal this to some extent by holding bad debt in the system, and it can be done for years. This is what IRTA Executive did with Universal Currency – keeping failed exchanges live in the UC system so that large bad debts were not written off (which means that the currency would take a hit). IRTA Executive actually went a step further than that and kept charging fees to the dead exchanges for years, thus claiming performance bonuses, but that’s another story and I digress. BBX Australia strikes out on both these metrics. First-up there is a $4m difference between members in Credit and members in Debit. That’s not a good sign. Now there may be an explanation for this . . . it’s a bit hard to balance the books unless you are doing forensic accounting from the inside and even harder when you are dealing with those who aim to deceive, but a difference like this, while not prime facie evidence of fraud is certainly a strong clue. I mean if you can see the huge discrepancy as a Franchisee then surely there must be more? BBX Australia also wipes out spectacularly on the second metric I mentioned – their Bad Debt Reserve Fund (they call it their “BBX INTERNATIONAL LTD – DEBT RESERVE”). Now not only is their debt reserve in negative territory, it is a massive $16m ($8,396,605.62 + $8,396,305.62). So already we have an acknowledged serious issue within BBX’s own systems we haven’t even got into bad debts or hidden transactions! Let’s look into this a little further. The next largest debt by value is a bad debt: TRADEBANC INTERNATIONAL IN LIQUIDATION ($5,251,949.00). The interesting thing about this bad debt is that it is not a current debt. Another hit coming up on the [very sad] member’s Bad Debt Reserve Funds for sure! This then the picture of the primary assets within the BBX Australia currency, massive losses of value over decades of trading, all sitting there unable or unwilling to trade. There are 25 accounts with debts to the system over $100k (figures shown above). There are 180 memberships with balances between $10k – $100k, and 634 members with balances up to $10k. Another noticeable fact is the large number of BBX front companies and accounts, 204 clearly identified as such and many more likely to surface as my investigations continue. The bulk of these appear to be the legacy of the founders’ wheeling and dealing going back for decades. There are some new ones since the Founder’s incapacitation that I am investigating further. This though will take time. Note also that the largest of these credits (particularly those between 250k and $1m are BBX in-house accounts. I’ve used the saying before relating to foxes and the chicken-house. It’s certainly appropriate when you see the facts. The last thing to mention is that I always analyse the quality of the data. While it is easy to validate that I am looking at real data from an up-to-date system (I just phone one member that I know or who I know is cooperative and check their account balance etc), I know that most of the time when I investigate dodgy operations, I am dealing with deceivers. I must therefore question the figures in the system. As we all know from my previous blogging, Bartercard has off-balance sheet hidden trade debt in the order of HUNDREDS OF MILLIONS. If I note just one discrepancy in BBX data or one clear concern over ethics, then I can be sure that there will be figures off the books. With BBX there most certainly are. I will detail these in future posts, drilling down even further into property transactions and describe the way that BBX has leveraged their trade dollars for blatant tax avoidance, scamming their membership and more. One thing that you can be VERY sure of is that if there is information off-the-books then it is being hidden for good reason. I mean after all if it was good news for the members then surely they wouldn’t want to hide it? My assessment of the BBX operations and current figures in the system is that the BBX currency has devalued past the point of no return; that while the figures appear to represent losses in the system in the order of $T20m (That is AUD Trade Dollars) in fact it has been over the last couple of decades substantially more than this residual, and from my experience it is likely to be at a ratio of 10:1 or a factor of 10x, making the entire drain on the BBX members and BBX currency around $T200m (the AUD equivalent). Based on the BBX Australian actual membership and account data it is very clear to me that there is no way that the BBX currency can recover to any resemblance of equilibrium. It has been debased past the point of no return long ago and it’s continued existence (even if it will never have any real backing) can only be achieved by increased membership sales (they have been declining steadily for a decade), alternative income streams and/or through the concerted efforts of deception, the current management’s only real option. A decimated International network and string of other deficiencies will make this nigh on impossible. In my next post I detail what appears to be a cover-up in the UK and I share more details of the UK operations; all is NOT exactly as presented. In the event that any representative or associate of BBX International by way of employees, agents or subcontractors or any representative of IRTA challenge any aspect of the credibility of the collator of this data, me, I give notice that I will publish the entire contents of the database I worked from including the full calculation formulas and methodology I used AND information sufficient that the public may verify the credibility and accuracy of this analysis which will inevitably lead to the publication of personal information. I will also supply the full database AND information sufficient to demonstrate that this data can be and was obtained legally to any authority, anywhere on the planet. You however have full right-of-reply on this blog as detailed clearly in my Disclosure Statement. > BBX operations in Malaysia and Singapore is fully funded by Dr Lee and contrary to what you have reported, is still alive. Trade volume is negligible and Dr Lee has brought in different teams to try and revive the business. I have corrected the post to more accurately reflect reality, inserting the word “effectively”. Many franchisees are desperate to protect their investments. Associating with the Toumas or the toxic BBX brand and currency though will not be a successful strategy.